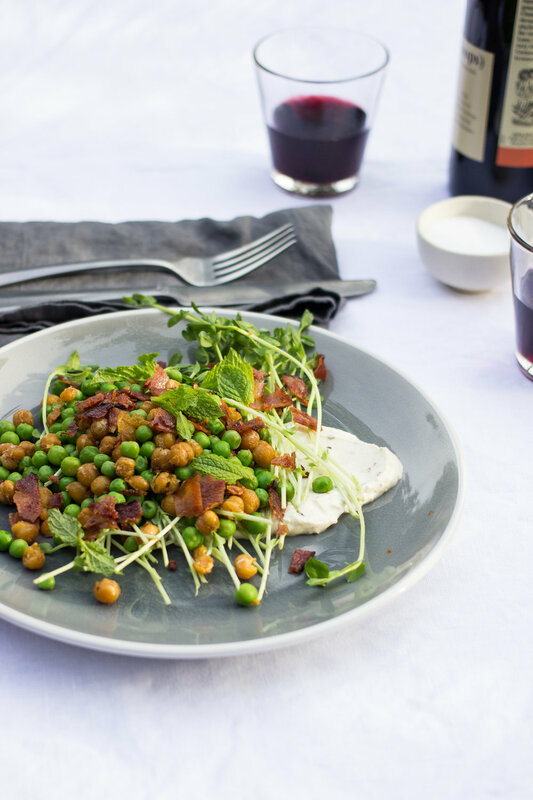 I love these crispy chickpeas, and I quite often just eat them on their own. They are satisfyingly crunchy, like chickpea popcorn. 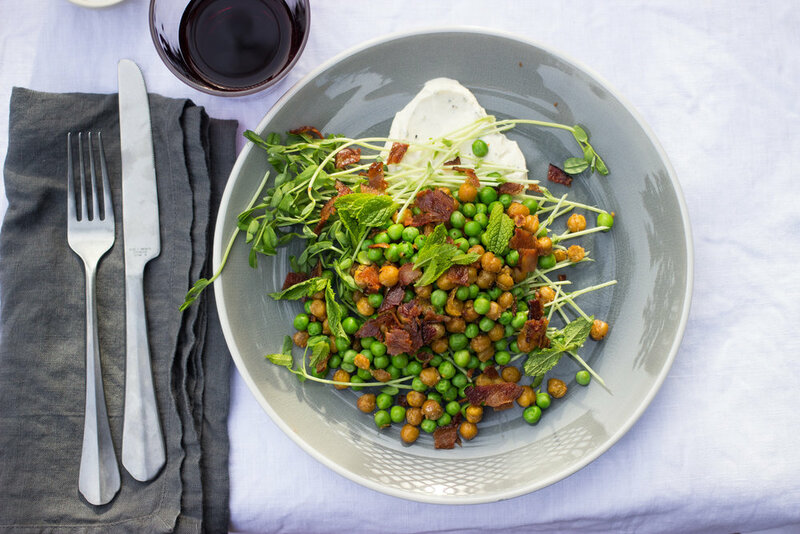 When I am feeling just slightly less lazy, I turn them into a proper supper: super fresh with lots of mint and lemon, rich and satisfying from goat cheese and bacon, and that nice smug-inducing healthiness from green pea shoots. This dinner has it all and it comes together fast too. Bake the bacon on a cookie sheet at 375 until crispy. Crumble and set aside. Drain chickpeas and let dry as much as you can. Heat grapeseed oil in a large frying pan over medium high heat. Stirring frequently, fry chickpeas until they are crispy and golden brown, about 8-10 minutes. Toss chickpeas with salt, garlic, cumin and paprika. While chickpeas fry, bring water to boil in a small pan. Blanch peas briefly in boiling water until just tender. Drain and set aside. 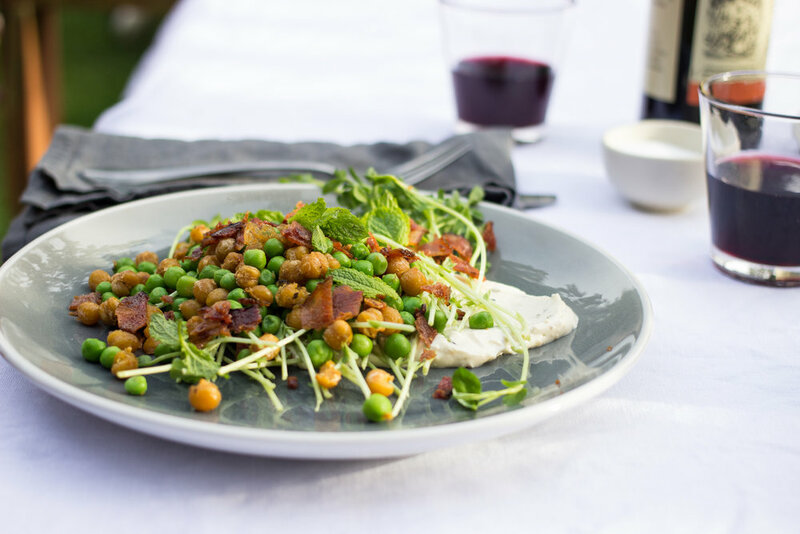 Smear a generous dollop of goat cheese cream onto each plate and top with pea shoots, chickpeas, peas, mint and bacon crumbles. Squeeze lemon and a few drops of olive oil over top of everything. Combine all ingredients in a food processor and blitz until smooth.